The V-Class DC271A, DC241A and DC211A digitizers, offering switchable 50 Ω/1 MΩ input impedance, are a development on the DC271, DC241 and DC211 waveform digitizers. 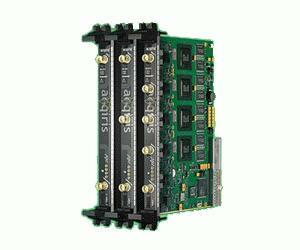 The DC271A has four channels that can synchronously sample signals at rates of up to 1 GS/s. The DC241A offers two channels each with up to 2 GS/s sampling. Using channel interleaving, both the DC271A and DC241A achieve the same 4 GS/s single-channel performance offered by the DC211A. The modules combine this ultrafast sampling rate with a 1 GHz bandwidth at 50 Ω, and 300 MHz at 1 MΩ input impedance. The DC271A, DC241A and DC211A include 128 kpoints, 256 kpoints, and 512 kpoints of storage memory respectively, optionally upgradeable to up to 8 Mpoints, 16 Mpoints and 32 Mpoints.